I can stand with my nose almost touching the glass and watch the activity in the bird feeder just on the other side just inches away. The fearless chickadees could care less. 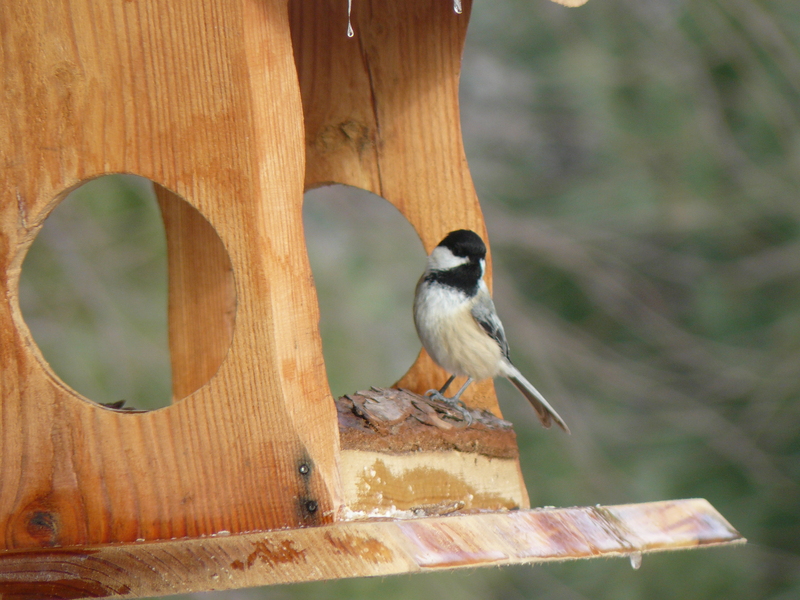 Once the feeder was discovered a few days ago, it has been a chickadee party out there. They hang out with Stella, beloved tree presence who dominates the view just outside the porch room. 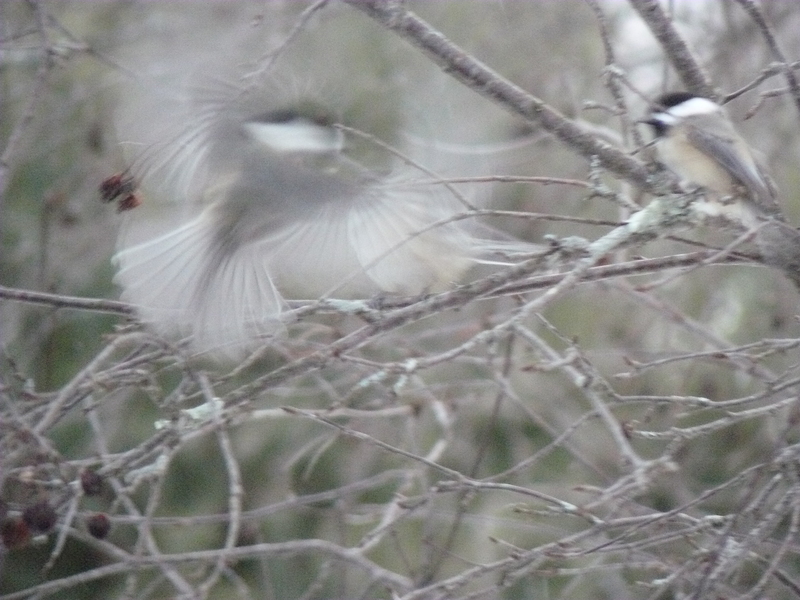 One or two at a time, the chickadees swoop over to the feeder, grab a seed, fly back to their perch. Trying to capture any of this is daunting right now as moments of rest for these creatures are brief, fleeting. Most of the time I just watch. From the moment of first light this activity begins and it continues non-stop until the last light of the day. I actually woke this morning wondering about where these chickadees go at night. Was surprised to learn from Google that they actually sleep alone rather than huddled together for warmth, impressively lowering their body temperature in order to conserve energy and survive the night on calories they were able to consume during the day. I imagine they have found special places for their nighttime solitude somewhere with Stella then. Up close, these bundles of energy are so present, unbearably cute, mesmerizing in their soft purposeful way. I wonder how long this honeymoon phase will last, of being caught up in the joy of watching and being, of sharing space with so much new life. Even after a few days of this I am able to notice the differences in each of them. And then feel the impact and drama when a tufted titmouse or nuthatch appears instead of the chickadee. Oh my. The parade just keeps expanding. The cardinals have arrived. The muted females dominating the feeder now, the bright red male strutting around on the ground for fallen seed. And there, a big blue jay checking out the scene, while the chickadees continue to weave continuous presence through it all. I like to say that I like my solitude. Until now, it has been more of an idea, a place where I could be alone, seemingly in silence, a place my nervous system could rest in peace. But now, solitude is infused with delightful birdsong. Yet it is still solitude. Solitude that feels rich these days sitting on the porch in the heat of the woodstove. 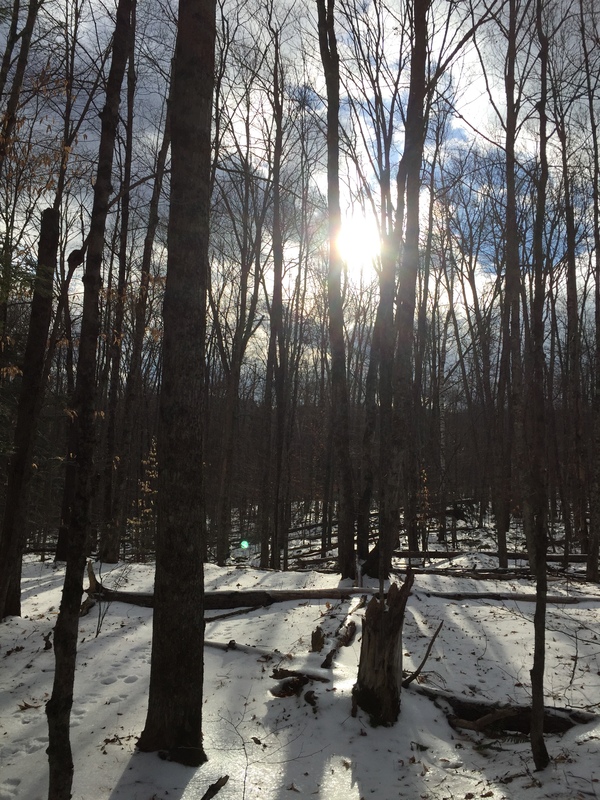 Some days it is with the bright sun, so bright that it calls us out to join with the solitude of snowy woods. 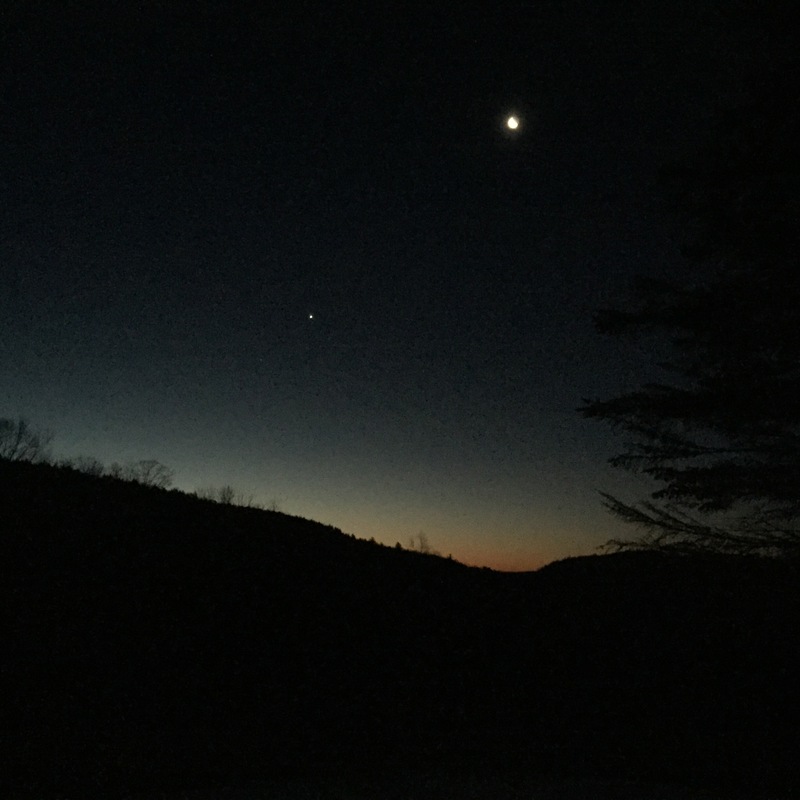 And then there is morning solitude before the sun appears, where the moon greets the rising sun in a deeply chilled sky. Solitude has become its own presence, like the chickadees, asserting itself wherever I am. Yes, solitude is alive too. This post makes me feel peaceful.